Trying to find a letter that I read online some time ago written as a first person account by a 94th member relating his experience while, I think, serving as a member of a support/logistical unit The particular event that caught my attention perhaps occurred while pack boarding ammunition to units engaged in the crossing of the Saar River on 21 Feb 45.. The team (maybe just two of three) had recently been issued new uniforms and while in the process of moving the supplies forwarded decided to stop at an abandoned farm house to put them on -- and left their old uniforms behind. On their way back from the front they stopped again at the farm house, maybe to spend the night. There they found the old uniforms on the dining room table, washed and neatly folded. This could have possibly been in the vicinity of Orsholz along and likely south of the Oberleuken Rd as the writer described seeing bodies lying covered in the snow. As you know, this is where the 1/301 got into a mess on the night of 19 or 20 Jan when they attempted a flanking attack on Orsholz - and where my father was killed on 21 Feb while recovering the bodies of the men killed there a month earlier (given that the Germans were in the process of falling back across the river not sure why they could not have waited another day). Recently, I was telling an Army Chaplain/Col, stationed at Ft Bragg, about this incident of kindness in midst of chaos and it really peaked his interest. If this is something you can redidly recall/locate I would be great if you could forward me the link and I will forward it on to the Chaplain. However, please do not spent a lot of time on this. Also, it may be something that Harry is familiar with but not knowing his condition did not want to bother him. “I was home from college at Ohio State, riding in a friend’s car, when the news flash about Pearl Harbor came over the radio,” Harold Hiner recalled. “That immediately changed everything.” That incident would eventually take the young Ashland County resident halfway across the globe and into the European theater of World War II, where he would become a prisoner of war in Nazi Germany. Harold Hiner was born in Mansfield but raised in Ashland, on a 23-acre farm his father had bought along US 42, that also came with a gas station. "Hank," so christened by an aunt, and his siblings helped out around the farm and at the station. When time permitted during the summers, he could often be found swimming at Brookside Park. 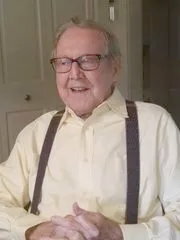 Harold graduated from Ashland High School in 1940, enrolling at the Ohio State University in Columbus in the fall to pursue degrees in agriculture and economics. In April 1943, however, Hiner decided to enlist. Hank was sent to Fort Eustis, Virginia, for basic training and artillery school; he would, however, take a slightly different course. “After I got there I sent home for my snare drum,” Hiner chuckled; he had become an avid drummer in high school. “We’d go on these marches and I carried my drum instead of a field pack, and I’d keep cadence while we marched.” That skill got him transferred to the base’s cadre band, which came with the added benefit of a pass that allowed the young soldier a little extra freedom from the camp confines. “I thought, ‘This is great, I’m gonna be here.’” It wouldn’t last. After short stays in Grenock, Scotland, and Earlstroke, England, the 94th Division crossed the English Channel and landed on Omaha Beach, exactly three months after the D-Day landings on June 6, 1944. One operation in particular Hank will never forget: the attempt to take the town of Orsholz, which lay behind German lines. “We got trapped, had to run across a field. I took my boots off and ran barefoot through the snow so I could run faster” while under fire, Hiner recalled. “That was a bad idea because I got frostbite.” Hank and the rest of his company took refuge in an abandoned brick factory, trying to avoid Nazi artillery and mortars. As German troops closed in and their position became untenable, the company commander made the decision to surrender. The date was Jan. 21, 1945. Hank remembers a series of forced marches and a train trip in railroad freight cars that finally brought them to the German town of Limburgh and Stalag XII A, a prisoner-of-war camp. “We slept on straw inside a large building without heat or blankets”, he recalled. The POWs were given a sixth of a loaf of bread per day and a little thin soup “that had two or three small potatoes in it.” Sanitation for the men didn’t exist under such filthy conditions, causing virtually every prisoner to become infested with lice. They would remain that way until the end of the war. Another trip by rail in the cattle cars took place on Feb. 17 and lasted five days; at one point the train was strafed by American aircraft, unaware that Allied POWs were inside the cars. Hank and his outfit were finally unloaded at Stalag XI B, outside the northern German town of Fallingbostel on the banks of the Weser River. Hank recalled that there were other Allied prisoners in Stalag XI B besides Americans. “The British had their own section, there were some French and Polish, and Russians. Liberation day for those in Stalag XI B came on April 16, 1945, in the form of B squadron of the 11th Hussars British Armored Division. “Those Limeys, with their heads sticking out of the tanks, looked mighty good to us,” Hank said. The POWs were kept in the camp and administered medical aid, rations and water for a period, then shipped to Brussels, Belgium, where, thanks to American-supplied disinfectant, they were finally and completely deloused. Once back in the States, Hiner said he hitch-hiked home to Ashland, where a joyous reunion with family took place. “I was walking up the drive when my Mom saw me and started yelling ‘Hank's home! Hank's home!' They didn’t know what had happened to me. I was declared missing in action, so it was quite a shock when I got home,” he smiled. During his time in service, Hank was awarded a Bronze Star and Purple Heart. Now-Corporal Harold Hiner married his sweetheart, Betty, with whom he enjoyed 70 years of marriage until her passing last year. Together they raised three daughters as Hank worked first in the feed industry before moving on to being a stock broker. 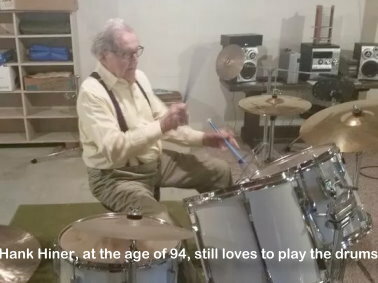 Living in rural Ashland County, Hank spends his days visiting with friends, traveling and playing the drum set in his recreation room. My father Harold Schultz was in the 94th division, Company G, 301st. He did his basic training at Camp Grant. I keep searching old footage to see if I might spot him in any of those videos from "Critical Past", and "Chronos", as they have footage of the 94th. I have a few of his letters, one of which says he "joined the outfit February 19, 1945"
He was a cook but also had two battle stars. I don't know exactly which battles he was in for sure, just possibly which ones came after the date he mentioned. Mar 11, 1945 Letter from Dad says he was in Hilden, Bremsly Co. At the end of his time in Europe he was in Cesky Krumlov in Czechoslovakia. He mentioned the Russians, and that someone was beating up someone they considered a traitor. He said he stayed in a local hotel and that the locals were trading horses out front. He was born in 1918 and died in the 1980's. He told me about land mines, and fighting in a forest. He also taught me to count in German when I was a little kid. His family was German American, having moved here way before Hitler was even born. Escape from WWII POW Camps! Starting in 1940, an increasing number of British & Canadian Airmen found themselves as the involuntary guests of the Third Reich, and the Crown was casting about for ways and means to facilitate their escape… Now obviously, one of the most helpful aids to that end is a useful and accurate map, one showing not only where stuff was, but also showing the locations of 'safe houses' where a POW on-the-lam could go for food and shelter. Someone in MI-5 (similar to America 's OSS ) got the idea of printing escape maps on silk. It's durable, can be scrunched-up into tiny wads, and unfolded as many times as needed, and makes no noise whatsoever. At that time, there was only one manufacturer in Great Britain that had perfected the technology of printing on silk, and that was John Waddington Ltd. When approached by the government, the firm was only too happy to do its bit for the war effort. By pure coincidence, Waddington was also the U.K. Licensee for the popular American board game Monopoly. As it happened, 'games and pastimes' was a category of item qualified for insertion into ‘CARE packages', dispatched by the International Red Cross to prisoners of war. Under the strictest of secrecy, in a securely guarded and inaccessible old workshop on the grounds of Waddington's, a group of sworn-to-secrecyemployees began mass-producing escape maps, keyed to each region of Germany , Italy , France or where ever Allied POW camps were located. When processed, these maps could be folded into such tiny dots that they would actually fit inside a Monopoly playing piece. British and American air crews were advised, before taking off on their first mission, how to identify a 'rigged' Monopoly set –by means of a tiny red dot, one cleverly rigged to look like an ordinary printing glitch, located in the corner of the Free Parking square. sets. Everyone who did so was sworn to secrecy indefinitely, since the British Government might want to use this highly successful ruse in still another, future war. Many of you are (probably) too young to have any personal connection to WWII (Sep. '39 to Aug. '45), but this is still an interesting bit of history for everyone to know. I see many posts for information about relatives that served in the 94th. I too would like information about my father who served during WWII however I realize that most of the veterans that served during that period have passed. I have his Ike jacket with his service number however it is badly faded and not entirely legible. I was advised to ask the records department of his home town for his discharge papers since many returning veterans were encouraged and given a monetary incentive to turn in their discharge papers in their hometown. His home town is still a very small town and they told me that if they did have such records they would be in storage and that they didn't have the resources to search for them. I'm at a bit of a dead end. Are there any existing records listing listing members of the 94th during WWII such as daily unit report? This is one of the Army's oldest reports listing those present for duty, in the hospital, killed in action, wounded in action, missing, etc. It is typically filled out by the company clerk and signed by the C.O. My father was T-4 Charles Macquarter Roberts (known as Mac by many) who was from Collinsville, Alabama. I am looking for any information on my grandfather, SSgt Dennis E. Harding who was in 94th Division G/302. He was wounded on 27 January 1945 at the Battle of the Bulge. He passed away in 1980. He only spoke of the war to my father and my father passed away in 2007 taking all info with him. My siblings and our children would be very grateful for any memories or information regarding him. His records were burned in the St Louis fire. My grandfather was a huge 5'3 so maybe that would stir a memory! George J Morris of F/302, who passed away on January 9, 2017, will be buried on June 3rd 11 AM at the East Conneaut Cemetery, Conneaut Ohio. Military honors will be rendered by the American Legion Cowle Post 151. I am looking for information on my grandfather, Harry Swanson. 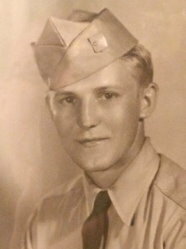 According to my mother (his daughter), Harry was in the 94th infantry division. After looking around online, I found his name on one of your webpages, he is listed as f/301. I have searched through postings on your site and have only found his name referenced on the link above. I've also been trying to sort through papers, hoping for more information. Is there anything else I should be checking to further my research on my grandfather? Would you happen to know anyone in the photo? Where was it taken ? Listed below are 39 names from the back of the photograph (that we were discussing) and that is attached here as well. There are about another 10-12 names that I was unable to read clearly. 390th Service Company/Field Artillery Battalion. PFC George Sherman: My Uncle, PFC George Sherman served in both the 90th and 94th Divisions in WWII as a Combat Infantryman. We believe he departed for Europe with the 90th on 24 Mar 1944, served with the for some unknown period of time 94th between 1944 and 1945, and departed from Europe as a “High Pointer” with the 90th in Dec 1945. 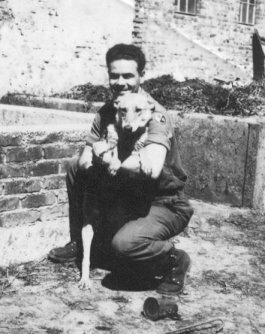 He was Discharged around 27 Dec 1945. This is the photo taken after his Discharge. He died in an auto accident shortly after Discharge. Any information regarding George would be greatly appreciated! I am Douglas Kondziolka. 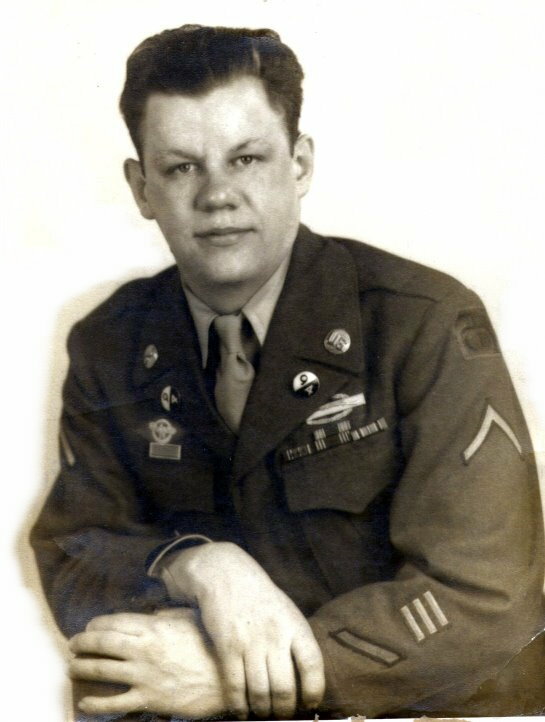 My father, Theodore Kondziolka E/302 of the 94th Infantry (WW II) passed away about a year ago at the ripe old age of 93. In going through some of his memorabilia I have discovered a cache of old WWII photos from the 94th Infantry. I was wondering if there would be any interest in receiving copies of these photos. I am searching for ‘any’ information on my father; JOHNSON, RALPH B. who served with the 94th Inf. Div. I'm trying to find out information on my Dad while serving in the army during the War The following is what is written on his tombstone..Not sure what his MOS was but his sister told me that she thought he was a Cook..
Any information you can provide would be greatly appreciated..
My name is Mathew Yeaton, my grandfather was Thomas L. Fairchild and from what I have learned as of late, was that he was a 1st LT in company G 376th Infantry Regiment 94th Infantry Division. My grandfather died in 2003 and while he was living he never talked about the army and only one photograph existed in his home. He retired from the Army as a Major sometime in the 60's but records have been difficult to come by. Recently (over the last two years) my family has received some of his records from the archives with the help of Senator King's office. At 36 and a 15yr police veteran, I am trying to learn as much about his career as possible. I'm curious if there is anything you might be able to help me with such as photos, records etc etc. thank you for your time. Subject: Frank L Waller Jr B/302 "tattoo"
My farther Frank L Waller Jr was part of the Co B 302 Inf Reg 94 Div he has a tattoo on his left arm and a belt buckle that looks like a set of wings with a propellor running through the middle of the wings. Can anyone tell me what part of the 94th he was in. My uncle was Tech Sgt Robert Selby Johnston 3rd platoon Sgt Co. I, 3rd Bn 301st Rgt. Can anyone tell me who was Co. 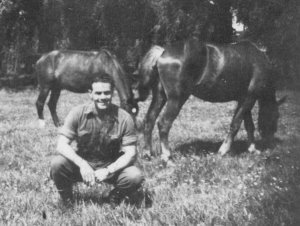 I commander, and 3rd platoon commander during Jan – Feb 1945. Johnston was burned by a flamethrower on 5 Feb in the Untersie Busch area. My name is Brieuc Cudennec, I am a 32-year old French historian, born in Brittany and living in Paris. Like many countries, France and the United States have suffered because of the war. I have learned a lot about this period with my studies in France and in Ireland and I am still very interested of all the points of history during the Second World War. I would like to correspond with persons who knew well the war and may be who was a soldier in that time. The deeds of the 94th Infantry Division soldiers were crucial in the liberation of Brittany, my area, and we must write more about it. I would like to have with these people a correspondence for speaking and writing about these memories.